Colin Baker (The Doctor), Maggie Stables (Evelyn Smythe), Karen Henson (Monitor Trinkett), James Campbell (Assistant Monitor Ensac) , Andrea Newland (Commander Vorna) [1-2], Anthony Keetch (Coordinator Vansell), Toby Longworth (Monan Host) [1-2], Michael Wade (The President); Alistair Lock, Nicholas Briggs (Dalek Voices); Lalla Ward (Romana) [2-4], Andrew Fettes (Vrint) , Andrew Fettes (Captain Reldath) [3-4], Neil Corry (Alien Delegate) [?]. When the planet Archetryx is threatened by a Dalek assault squad, the Doctor and Evelyn become embroiled in an ever-deepening mystery. What has become of President Romana, missing for twenty years? What lurks in the vast gravity wells of Archetryx? What is the secret of the ancient element the Daleks are synthesising -- and how does Gallifrey feature in their plans? Featuring the Sixth Doctor and Evelyn, this story takes place between the television episodes Trial of a Time Lord and Time and the Rani. Second story in the Dalek Empire series. Twenty of the greatest powers in time and space are attending a conference on the planet Archetryx, the site of a rather disturbing incident in the recent past. Monitor Trinkett is determined to ensure that nothing goes wrong, but despite her best efforts there have been a number of unexplained energy surges from her planet's gravity wells, and the delegates are becoming concerned. The TARDIS materialises in the conference hall, drawn through Archetryx's temporal shields in the wake of a powerful time vessel -- presumably the ship from the Monan Host world. The Doctor and Evelyn are nearly arrested by Commander Vorna when they emerge, but to the Doctor's surprise, Co-ordinator Vansell of the Celestial Intervention Agency steps in and identifies them as members of the Time Lord President's personal staff. Vorna, irritated by the Time Lords' apparent disdain for Archetryx's security procedures, takes Evelyn to the security centre, while the Doctor accompanies Vansell to speak with the President and learn why the isolationist Time Lords have chosen to attend this conference. The Doctor is greeted warmly by the elderly President, who explains that he was called out of retirement to serve during Gallifrey's current state of emergency. Twenty years ago, unique elements which seemed to disobey the laws of physics were found on Etra Prime, the oldest known planetoid in the Universe. Since Etra Prime was in Archetryx's space, representatives from numerous interested worlds traded with them in exchange for permission to send a scientific team to Etra Prime. Shortly afterwards, however, Etra Prime vanished into time and space, taking 500 people with it, including the newly elected President of the Time Lords. One year later, three hundred of the missing scientists were found dead on Archetryx, their bodies riddled with time distortion. Only the fact that Archetryx clearly did not possess the means to commit such a crime prevented a war, and its desperate people were only too happy to volunteer their world as the site for this conference on the limitation of temporal manipulation. The Doctor realises that Vansell is attending in the hopes of conducting a little espionage on the other species which possess time-travel technology -- but the President is here in the hope of learning who or what is responsible for the disappearance of Etra Prime... and of President Romanadvoratrelundar. While searching for the Doctor, Evelyn spots the High Minister behaving suspiciously, and follows him to the hall's berthing bays -- where she sees him plant a bomb by the exterior wall. She is nearly buried under the rubble when the bomb goes off, killing the High Minister, bringing down the wall and allowing a squad of Daleks into the building. The Doctor repairs the internal sensors just in time to see his greatest enemies invading the building, preparing to destroy the engineering section. As long as the shields remain active the delegates will be unable to escape. Vansell offers to rescue Evelyn on the condition that the Doctor use his expertise to lower the shields again. As the Doctor gets to work, Ensac dies, his usefulness as a Dalek pawn fulfilled. But what do the Daleks want -- and why are they apparently steering Etra Prime on a collision course towards Archetryx? Vansell and Vorna rescue Evelyn, but are too late to prevent the Daleks from destroying the engineering section. Rather than proceeding to exterminate the delegates, the Daleks instead attempt to steal the Monan Host vessel -- the only ship powerful enough to force its way through the active shields, and the reason that Vansell came to the conference in the first place. The Monan craft is not dimensionally transcendental, however, and only eight Daleks will fit inside. They are able to pilot it through the shields and back to Etra Prime, however, and the remaining Daleks fan out through the docking bays and self-destruct, bringing down the walls and blocking the doorway with rubble. The delegates, already trapped behind the shields, have now been cut off from their time machines. For twenty years, Romana has been a Dalek slave on Etra Prime, confined to a small lightless cell for days at a time, given barely enough food and exercise to keep her alive, and forced to carry out those tasks which the Daleks cannot or will not perform themselves. The soul-numbing routine is killing her a little bit each day. When the stolen Monan ship arrives, Romana and a former Monan engineer named Vrint are ordered to remove its main drive and use it to construct a temporal centrifuge. As they work, Romana notes that the Daleks are communicating with a science team still hidden on Archetryx, using crystal implants which seem to channel Dalek mental energy; presumably they are avoiding conventional transmitters in order to prevent their team on Archetryx from being discovered. The science team's creation, something with the ominous name of the Apocalypse Element, is to be transmatted into an inertia chamber on Etra Prime, and Romana deduces that it must be too volatile to handle by conventional methods -- and that the temporal centrifuge is required to accelerate the process and allow the Daleks to harvest the Element before they abandon Etra Prime for good. The Doctor gets Trinkett to safety, and just as he is about to be overcome by his attackers a surge of energy through the gravity wells weakens the Daleks and allows him to escape. Evelyn has followed the Doctor, seen his predicament and tampered with the wells' controls to create a distraction; unfortunately, although she has saved his life, she's also created a feedback loop which threatens to blow the wells open and kill them all. The Doctor sets up a counter-harmonic vibration and stabilises the power surge, but is forced to devote the console's entire programme to maintaining this stability -- which means that the only way to lower the shields is to enter the gravity wells once again, risking another attack from the mutants. The Black Dalek informs the trapped delegates that the surviving Daleks in the berthing bays are plundering the secrets of the delegates' time machines. Attacks have been launched on the delegates' home worlds, and the people of Archetryx will not be of any help; their leaders were replaced with Dalek duplicates long ago, who manipulated the powers of the galaxy into holding their conference here. Soon Etra Prime will collide with Archetryx, destroying both worlds. Realising that they have been played for fools, the delegates agree to work together to break through into the berthing bays. Vansell contacts the Doctor to update him on the situation, and Evelyn offers to help clear the rubble away from the berthing bays. As soon as the delegates break through, however, the Daleks open fire upon them, driving them back. Evelyn and Trinkett offer to look for another way through; perhaps if they find an inspection hatch they can get behind the Daleks and create a distraction. As Vrint and Romana work, they learn that the Daleks intend to crash Etra Prime into Archetryx, destroying both worlds and all evidence of what they have done here. As soon as the two planets are within transmat range, the science unit on Archetryx transmats the Apocalypse Element to Etra Prime, and the Black Dalek orders Romana to operate the temporal centrifuge so the Element can be harvested. Romana claims that she must first examine the transmat to ensure that the Element was not damaged by its transfer. The Black Dalek is suspicious and orders his guards to exterminate her, but Romana and Vrint take shelter behind the inertia chamber, and the Daleks are unable to fire upon them for fear of damaging the Element. Romana reverses the settings on the transmat and sends herself and Vrint back to Archetryx, along with one of the Daleks' focussing crystals -- a vital element of their plan. The transmat is damaged when the Daleks attempt to gun down the escaping Romana and Vrint, and they are thus unable to follow her. The spearhead on Archetryx must recover the crystal, whatever the cost. The Doctor enters the gravity wells to complete his work, and this time, by keeping his torch off and staying quiet, he avoids the Dalek mutants long enough to reach the shield controls. They soon find him again, but as they launch themselves at him Romana and Vrint materialise nearby, distracting the Doctor's attackers. The Doctor manages to switch the lights on inside the wells, disorienting the mutants long enough for him to switch the gravity on as well. The mutants are crushed against the walls by the sudden return of gravity to the wells, and the Doctor completes his work and switches off Archetryx's temporal shields. He is then joyously reunited with Romana, and finds that she and Vrint have materialised a Dalek laboratory set up to synthesise a substance which could only be created in the unique conditions of Archetryx's gravity wells. The Dalek embryos in the wells have also been implanted with the thought-transfer crystals, but the Doctor and Romana have no time to ponder their discoveries. As they flee back to the berthing bays, the Doctor is shocked by Romana's callous dismissal of her fellow slaves, trapped on Etra Prime and doomed to death; twenty harsh years as a Dalek slave have changed his former friend. The President and Vansell return to Gallifrey, and the furious President demands an immediate meeting of the High Council to determine their response to the Daleks' latest outrage. Captain Reldath then reports that a delegation from the Monan Host world has arrived in Gallifreyan space, seeking sanctuary; they are being pursued by Daleks which have invaded their own home world. The President sympathises but is unwilling to intervene in matters of war; however, Vansell points out that the Monan Host time ship is smaller and sleeker than the one they saw on Archetryx, and therefore must be more advanced. He still wishes to learn the secrets of the Monan Host's technology, and therefore suggests that they allow the flagship through the transduction barriers; they will then be able to set terms for future assistance. Even as they speak, a Dalek fleet is approaching Gallifrey and the Monan refugee fleet; the desperate Monans will agree to any terms the Gallifreyans set. Reluctantly, the President agrees to let the flagship through the transduction barrier, and Captain Reldath transmits the co-ordinates of the TARDIS cradles to them. It is this transmission which the Doctor picks up, and only he suspects the truth. But he has no way of warning the Time Lords, who go to greet the Monan delegates -- only to be attacked by a spearhead of twenty Daleks. This is not a Monan ship at all, but a disguised Dalek time machine... and the Daleks are invading Gallifrey. The Doctor's TARDIS materialises in the cradles, and as the Doctor prepares to face the Daleks, the others offer to accompany him; if Gallifrey falls, what will the Daleks set their sights on next? The TARDIS doors open upon a massacre; the ceremonial guards in the cradles never stood a chance against an invasion force. The Daleks surround the Doctor and his friends and prepare to exterminate them, but Romana offers to give them the Presidential codes they need to lower the transduction barriers. Vansell and Reldath arrive with their forces, but fortunately they hold off to see whether Romana is bluffing, and she is able to penetrate the Dalek neural net using a stolen thought-transfer crystal and release twenty years of repressed loathing and hatred upon the Daleks. The spearhead is stunned, and the Doctor and his friends manage to escape from the cradles; however, the Daleks detect the presence of an intruder in their group mind and expel her. The Doctor gets her to safety before the spearhead recovers, but she has touched the Dalek mindset and knows that they are planning something truly evil with the Element they harvested from Etra Prime. A chance comment from Evelyn inspires the Doctor, who takes her and Vansell to security control while Romana confers with the President. Trinkett and Reldath remain, trying to hold off the Dalek spearhead and buy the Doctor time. At the security centre, the Doctor has Vansell order the operators to stand down and then uses Vansell's security override to erase every Gallifreyan retinal print from the Matrix and install Evelyn's. The Daleks will no longer be able to use slaughtered Gallifreyan soldiers to bypass the security systems -- now only Evelyn's eyes can access the grid. The Doctor sends Evelyn and Vansell to pull the isolated guard patrols together, while he tells the President and Romana what he has done. Romana in turn warns him what she sensed in the Dalek neural net; the ancient essence mined from Etra Prime has been imbued with the evil of all the thousands of Daleks connected to the neural net, and the result is something almost inconceivably malevolent and destructive. The Doctor has no choice but to ask Romana to enter communion with the Daleks again, so they will have some idea of what it is they're up against. The Daleks shoot out the power lines, plunging the TARDIS cradles into darkness; whereas the Daleks can see in infrared, the Gallifreyan defenders are helpless. Reldath chokes up, and it is left to Trinkett to order the guards to retreat. They manage to escape seconds before the Doctor seals the bulkheads, locking the Daleks in the cradles. As they rest outside, Reldath confesses to Trinkett that he's completely out of his depth; the Time Lords thought themselves above the barbaric concept of war, and were never prepared for anything like this. Evelyn and Vansell arrive, but as Vansell explains the importance of protecting Evelyn, the Daleks burn through the wall of the cradles, cutting off their retreat. Meanwhile, the Black Dalek learns that the Apocalypse Element is now ready for use, and sends a soldier Dalek on a suicide mission. It is to take the Element to the heart of Galaxy 17A53, otherwise known as Seriphia, and there it is to self-destruct, thus demonstrating the power the Daleks now hold over the entire Universe. With every second's hesitation countless lives are added to an already incalculable death toll. Nevertheless, when Vansell calls from the TARDIS cradles to report that they are trapped, the Doctor goes to the rescue, opening a bulkhead, locating a Daleks whose eyestalk has been shot off, and using it as cover to steer the others to safety. He then pushes the Dalek towards the rest of its comrades, and as the blinded Dalek fires randomly into the darkness, the other Daleks delay to destroy it while Evelyn shuts the bulkhead. Reldath takes Evelyn to close the remaining bulkheads between the cradles and the Council Chamber and delay the Daleks for as long as possible, and then she joins the Doctor and Vansell in the operations chamber while Trinkett and Reldath remain to hold off the Daleks. The President is monitoring the devasation in Seriphia, and Romana, recovering from the mental backlash of the Element's ignition, accompanies the Doctor to the Eye of Harmony to set up the equipment they will need to contain the effect. Even if the Doctor and Romana succeed in controlling the Effect they will be handing the Daleks the means of controlling the ultimate weapon, but even so, the Doctor insists that they must save as many lives as they can. His frustration is getting the better of him even as Romana strives to remain objective, knowing what a mistake will cost at this stage. When Vansell and Evelyn arrive with the equipment they need, the Doctor installs it and tries to coax as much power through as he can... but it is ultimately not enough. Romana is forced to shut it down before the Eye blows them all to bits, and the President reports that the effect is still uncontained. 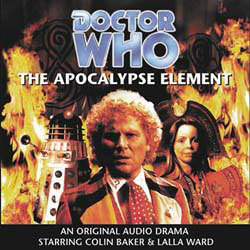 The Doctor, frustrated, loses his temper when Evelyn seems unable to comprehend the scale of the disaster they are witnessing; an entire galaxy four times larger than the Milky Way is burning as they speak, six hundred billion stars and an unimaginable number of lives have already been lost, and if they cannot contain the firestorm then it will spread out until nothing is left, anywhere. The Doctor calms down and apologises for his outburst, but Evelyn now understands the incomprehensible scale of the disaster, and goes with Vansell to fetch the power boosters which the Doctor requires. The President, knowing that the Doctor and Romana have tried and failed, has no choice but to contact the Black Dalek and offer a conditional surrender. He will allow an unarmed scientific team to land on Gallifrey if the Black Dalek orders the spearhead already on Gallifrey to self-destruct. The Black Dalek rejects his proposal and makes a counter-offer; if the President raises the bulkheads and allows the spearhead through to operations control, then they will allow him to disarm them. Trusting to the Daleks' urge to survive, the President accepts these terms and proceeds to the front lines, where he orders Reldath and Trinkett to fight to the last man should the Daleks renege on their agreement. He then raises the bulkheads, and allows the Dalek squad leaders through. As promised, they permit him to begin disarming them. Evelyn and Vansell find the power boosters which the Doctor requires, but are then confronted by a lone Dalek, which managed to slip through the bulkheads when the Doctor rescued them and which has now circled around behind them. As they flee, Evelyn is caught by the fringe of a blast and loses the feeling in her legs. Knowing that the Doctor needs the boosters and that the Daleks will have to keep her alive to use her eye-print, she urges Vansell to flee and gives herself up to the Dalek scout. Once it verifies that her eyes are indeed Gallifrey's sole security clearance print, it contacts the spearhead leader to inform it that access to the Council Chambers is now assured. The President has only disarmed one Dalek when they receive the news, and as they no longer require his co-operation, the other Daleks exterminate him. Furious, Reldath snatches up the dropped gun and destroys the disarmed Dalek, but he and Trinkett are then forced to flee as the remaining Daleks advance. The spearhead then shuts down the transduction barriers, allowing their fleet access to the planet. Gallifrey has fallen to the Daleks. Evelyn's eye-print briefly being programmed into the Matrix shall have far-reaching consequences in the TV Movie. The Time Lords and the Daleks later have a far more devastating encounter, as revealed in the new series episode Dalek.